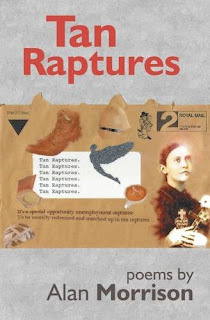 Blurb: Alan Morrison’s eighth collection transposes the brown envelopes that strike fear into the unemployed as passports to Rapture through a twisted Tory notion of ‘salvation’ by benefit sanction. Tan Raptures comprises verse-missives from the frontline of the war against the poor and its spirit-stripping weapons of food banks, poor doors and homeless spikes. It’s a people’s history, from Dale Farm and the firebombing of Freedom Bookshop to Troika-shackled Athens, featuring the Bryant & May Matchgirls, the International Brigades, Runnymede Diggers and Los Indignados. It’s a celebration of radical figures like Gerrard Winstanley, Joe Hill, Wal Hannington, Conrad Noël and Christopher Caudwell. The title poem is a Catholic Socialist polemic in opposition to self-proclaimed ‘Roman Catholic’ Iain Duncan Smith’s despotic six year grip at the DWP. Alan Morrison is author of several critically acclaimed poetry collections: The Mansion Gardens (Paula Brown, 2006), A Tapestry of Absent Sitters (Waterloo Press, 2009), Keir Hardie Street (Smokestack Books, 2010), Captive Dragons/ The Shadow Thorns (Waterloo, 2012), Blaze a Vanishing/ The Tall Skies (Waterloo, 2013), Shadows Waltz Haltingly (Lapwing, 2015) and Tan Raptures (Smokestack, 2017). He is also the author of the verse-play Picaresque (2008) and of an epic polemical poem-in-progress, Odour of Devon Violet (2014- www.odourofdevonviolet.com). He is founding editor of The Recusant (www.therecusant.org.uk) and Militant Thistles (www.militantthistles.com). He selected and edited the two pioneering anti-austerity poetry anthologies, Emergency Verse – Poetry in Defence of the Welfare State (2011) and The Robin Hood Book – Verse Versus Austerity (2012; both Caparison). His poetry has been awarded grants from the Arts Council, the Royal Literary Fund and the Society of Authors. BOOK REVIEW: Caesar Campbell (with Donna Campbell): WRECKING CREW- The Brutal True Story of the Bandidos’ Legendary Sergeant-At-Arms. Pan Macmillan Australia, Sydney, 2011 (277 pages). ESSAY: J.D.Salinger The Catcher in the Rye (1951): Failure of the American Dream? WHAT IS CHARLES BUKOWSKI’S BEST NOVEL? Bukowski, Charles - Come On In! I like alternative, small press stuff & sometimes add to the pile. I do this for fun & probably only until I strike it rich, If you are a reader of BM & would like to contribute some content please let me know. Send me a hard copy of your books, especially your first one for a possible review. No attachments please unless you have contacted me previously. All content © George Anderson & in the Features section- the respective authors. Copyright George Anderson. Watermark theme. Powered by Blogger.